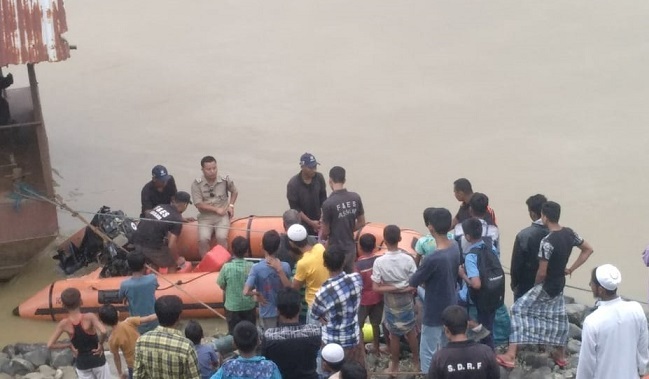 Hailakandi district police on Wednesday recovered the body of Sumit Pashi, one of the three victims who drowned during the boat capsize incident that took place at Lalamukh ferry ghat in Hailakandi district on last Sunday. Sumit’s younger brother Ajay and Ramesh Pashi are yet to be traced, though deep divers and SDRF personnel continued their search operation for the fourth day on Wednesday. The bloated body of Sumit was spotted by the people of Jyotsnabad-Madhopur area in the morning hours and they informed the police. Police reached the spot and sent the body to SK Roy Civil Hospital for autopsy. Several youths from Lalamukh tea estate boarded the already overloaded country boat at Lalamukh ferry ghat to witness the finals of a football match at North Jyotsnabad on the other side of the river. Deputy Commissioner Adil Khan has mourned the death of Sumit and expressed his heartfelt condolences to the members of the bereaved family. Khan assured all possible help and support to the family.